Ive tinkered with bowden setups in the past but, ive never tried one on the new V2 pb plus. 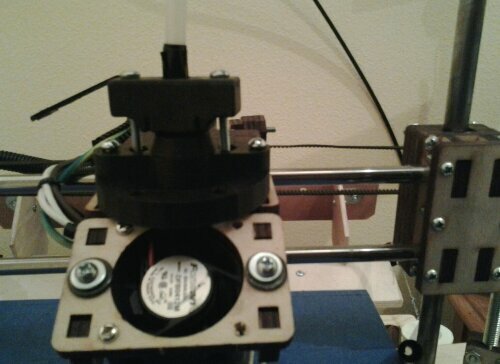 I have my spool mounted to my Printrstand and I would like to setup my bowden configuration with that. I know that some people say they have had issues with retraction and oozing. My goal is to limit or eliminate these issues with a few modifications ive been toying with. 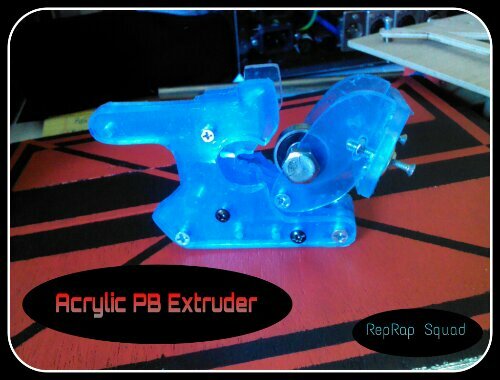 The bowden extruder I am starting with is a modified version of Richraps extruder design. It has been adapted for my PTFE tubing which is a little different size than your typical bowden tubing. I will also be using 3mm PLA to start with and eventually moving to the less difficult 1.75mm filiment. 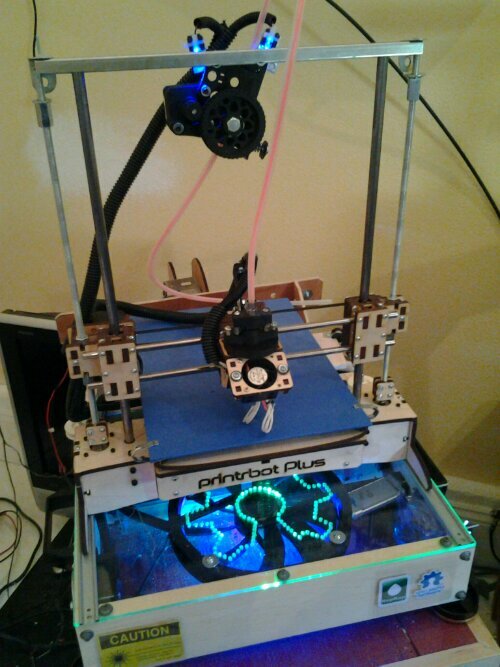 I was lucky enouph to have a friend print me a new extruder mount as well as the modified bowden extruder. 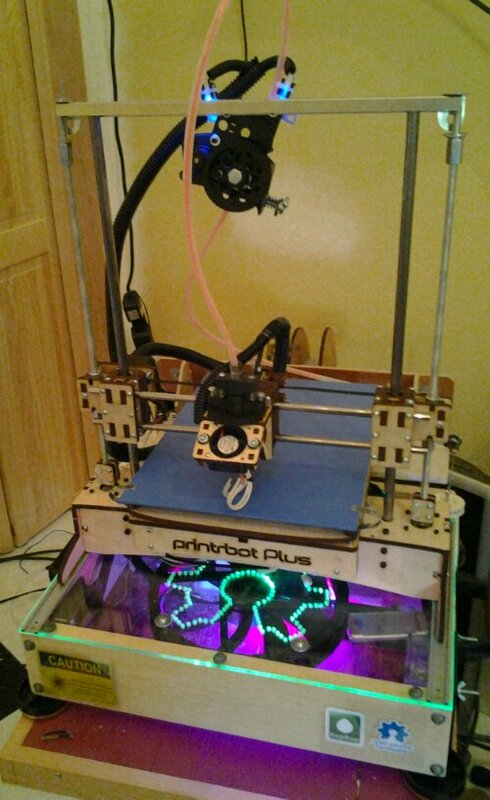 My Printrbot has been down due to upgrade complications. 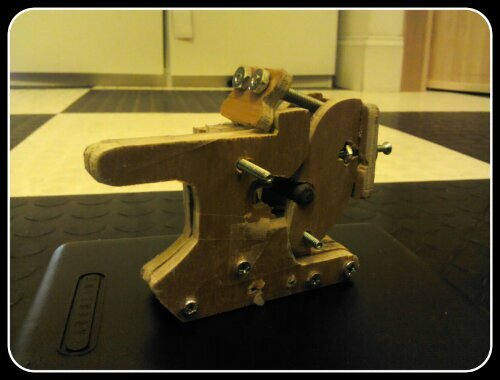 http://ei8htohms.tinyparts.netei8htohms has made some interesting improvements on the Printrbot GO. I would definitely spend some time looking through his blog. 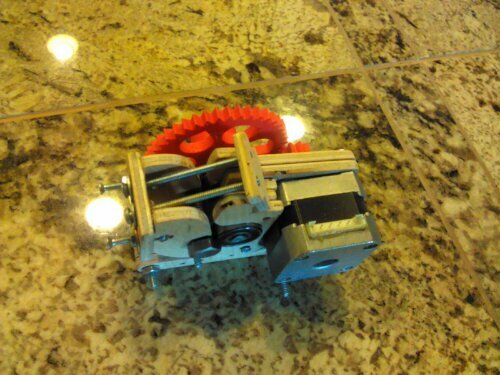 He has sent me some early pics of this extruder and it looks great. 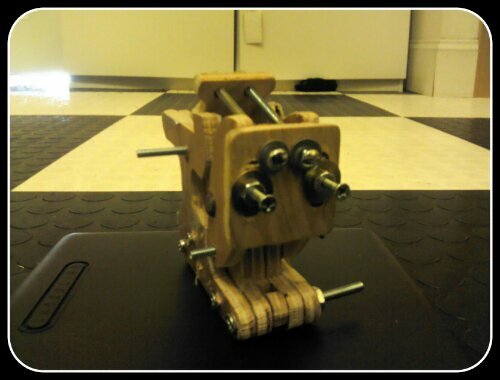 I cant wait to get them and start working on this bowden setup on the new Printrbot plus v2. 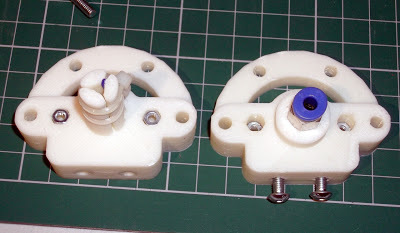 These are the extruder mounts for the bowden setup. I know have some stuff to show you as I have started to get the bowden setup started. 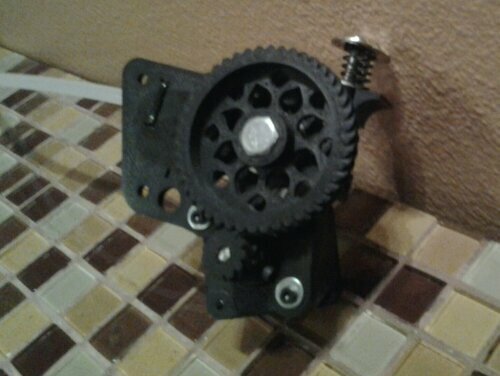 Ive recently been messing around with mounting locations for the bowden extruder. 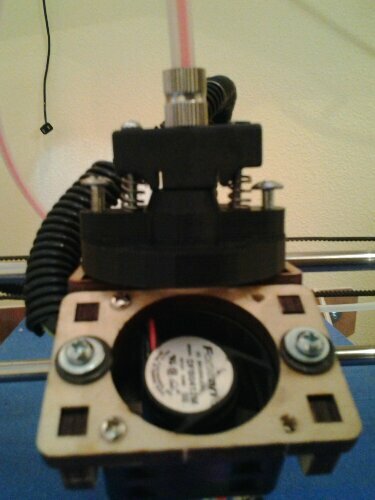 Putting it in different positions so I cqn measure the amount of stress put on the actual extruder mount. I also have to take into consideration that this will eventually be a dual extruder setup. So my mounts should preferably be A symmetrical. The mount seems to be happiest near this location in the picture. I will not however be mounting it in the exact pictured location but, somewhere close by. This position seems to put the least amount of stress or pull on the carriage. 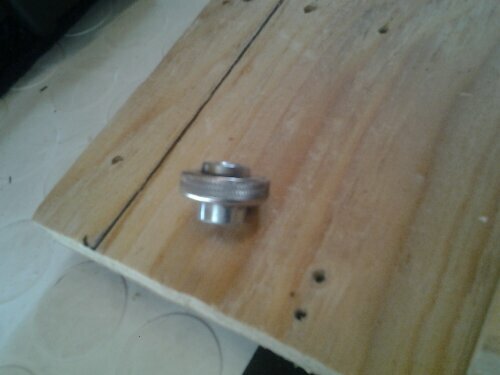 It is also convenient for the pull from the spool which will be fed through a lubricated bowden tube. Ive done some more work on the bowden setup to get everything the way I want it. 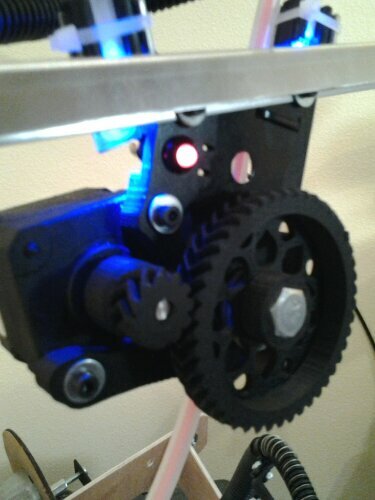 Today I added a red LED light to the bowden extruder as well as got most of the wiring in order. The red LED is to let the user know that the hotend is at or coming up to temp. This is a much welcomed addition as it lets other people know that it is hot without having to guess. 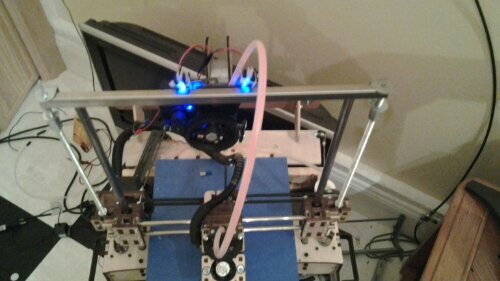 The blue LEDs come on when bed and extruder are at full requested temp. 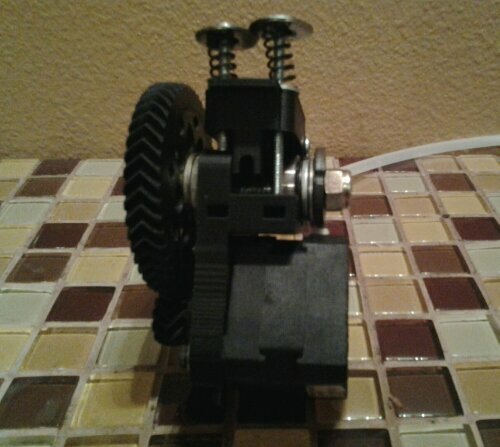 Here you can see the final mount for the extruder. 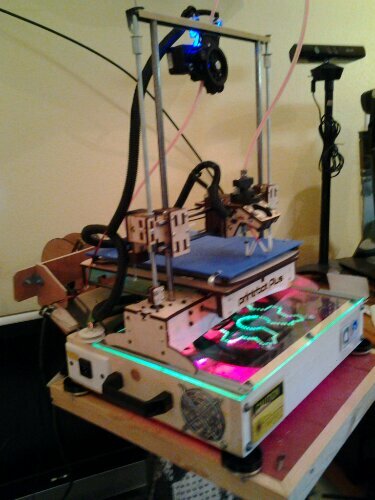 Eventually it will be changed to adopt a dual extruder mount. 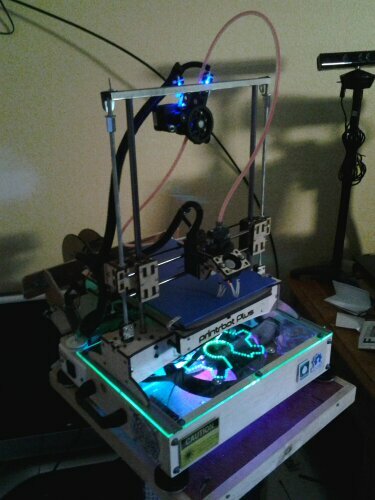 I also decided to add some more recent pics of the build as well as the Printrstand. The nice addition of the z axis stiffener made the z axis smooth rods completely unable to move in any way. 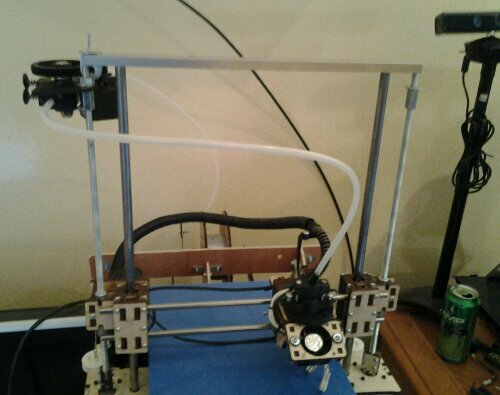 It has made quite an improvement as well as letting me mount the bowden extruder in tye best possible position. 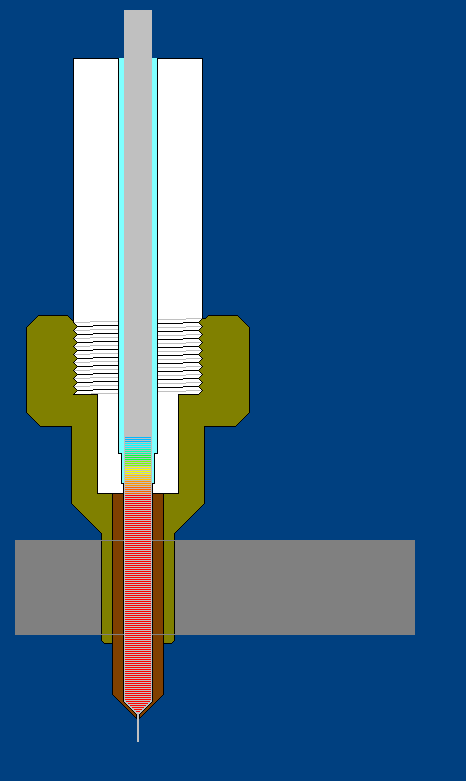 This position puts the least amount of pull on the extruder carriage. This is important for a smooth transition of positions during operation. All in all im happy with the modifications to date. There will inevitably be at least a few more modifications. 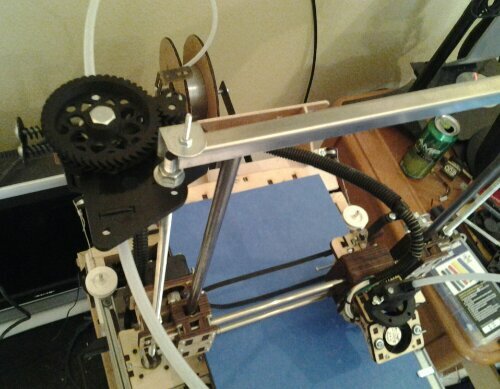 Some of those mods will include a printed cover for the x axis rod mounts that can be found on thingiverse. Also I will be making some sort of change to the z axis nut carriers which can be found on thingiverse as well. 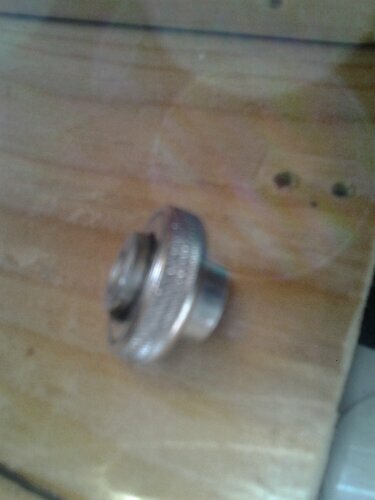 Im not sure if I will make my own solution to this part or use the one on TV. 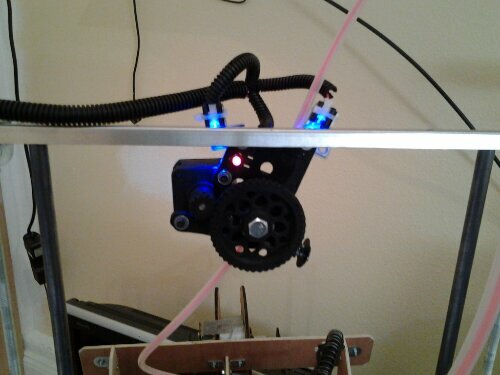 Some other changes that will be made include: Acme rods, nuts, GT2 belts, aluminum pullys, eventually an enclosure and a custom extruder to help eliminate drip from the bowden setup. I know that the bowden design isn’t perfected yet. That is one reason im building an all metal hotend of my own design that has been resting in the RepRap Squad archives since the bowden concept was conceived. It has been taken out for update many times and is ready to be made into a functional piece. This design looks somewhat similar to the E3D all metal design on the outside but has some very different concepts applied internally. It has a very sharp melt zone and can be ran with or without the use of a fan unlike most all metal hotends. Mine will be ran with a custom made muffin fan that is double as deep compared to most fans being used currently in the market. I will eventually open source the design once I have made the prototype to RepRap Squad standards. 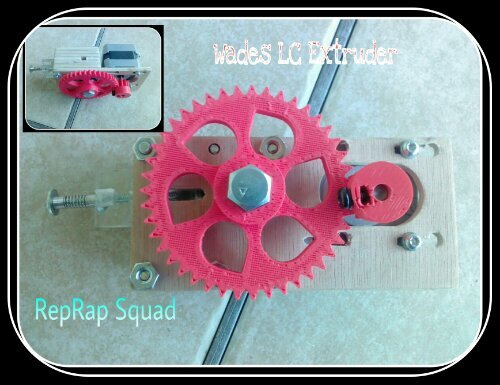 Originally I was just going to build a printrbot LC extruder but, later on I decided to also make a wades lc extruder as well. The printrbot version is almost done, I’ve finished sanding super smooth as well as making sure all the bolts and bearings fit how they are supposed to. The printrbot extruder has come together real well especially taking into consideration that I’ve never built an extruder out of wood. My plans for both of these builds is to post plans for those people who want to cut these out without a laser cutter as well as make the V2.0 made out of acrylic. I will be posting the plans asap. That way you can just print these plans out to scale and past them to whatever medium you want to use. This will make it really easy to cut out using basic tools that most people have laying around. I want to make sure that these designs are the best that they can be before I post them. 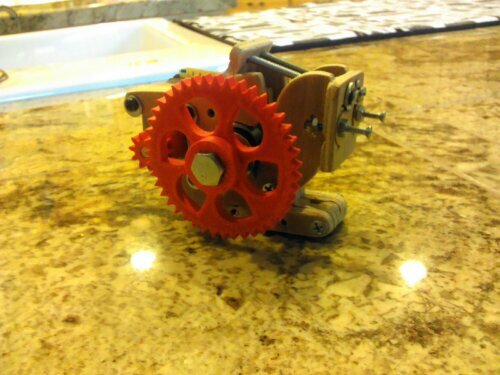 I will also post the cut outs for the gears even though more than likely I will be using plastic ones. 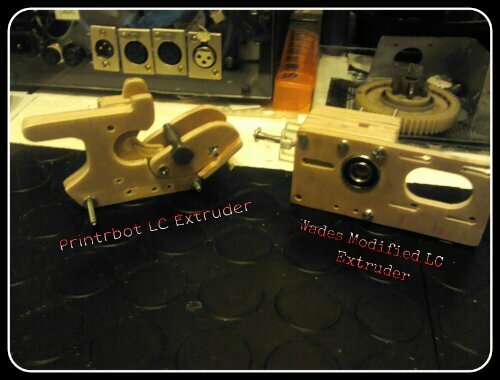 I will update the printrbot version as well as the wades version as soon as possible. 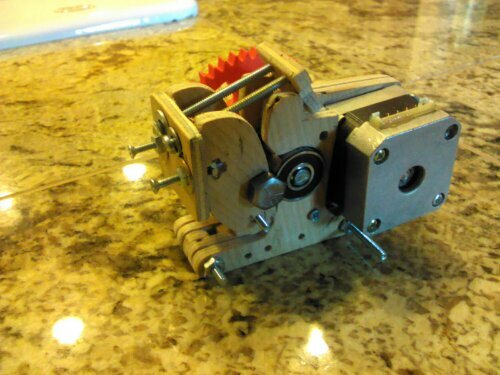 Today I decided that I wanted to take a chance and build the laser cut wooden extruder by Printrbot. The trick was that I wanted to build it with limited tools and limited cost. I also wanted to find and easy way to scale the files so they could be downloaded and properly sized without using a CAD like program. So I limited myself to Microsoft paint as a program. I also couldn’t find any files with measurements on them. 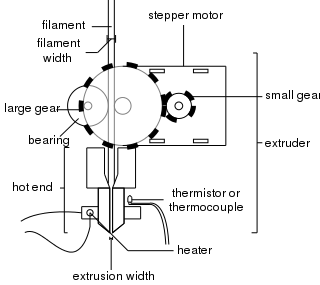 So I will be making my own set of plans with measurements so you too can easily make your own extruder without using CAD. I have cut out all the pieces from the file but I’m not completely happy with how it turned out so I am going to spend the next few days making the designs more accurate and user friendly. Check back as I will be updating as I go. Here are some of the early pics of the build. It still needs some kinks worked out. I also want to make some designs changes before I finalize. 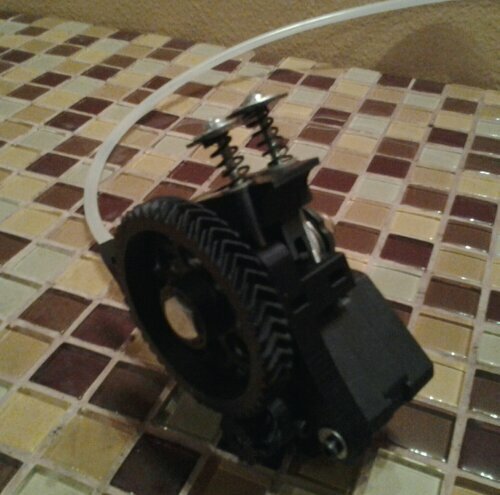 So I started working on the wades extruder some more. 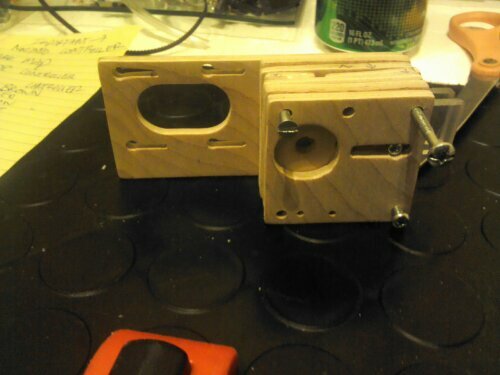 I have all the pieces cut out and put together but I still am trying to figure out the internal workings of the extruder. 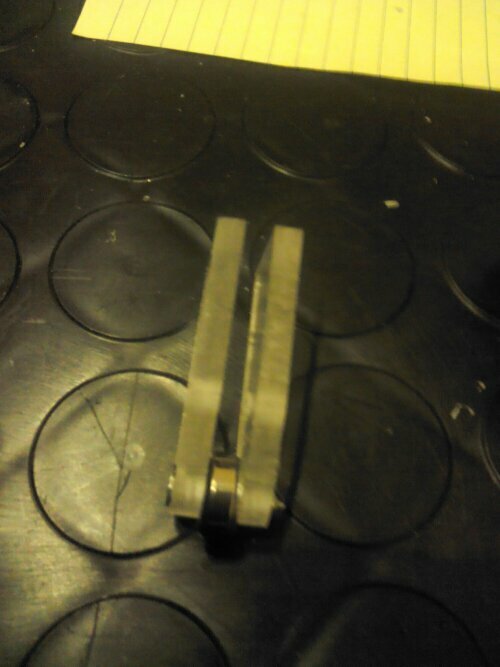 After spending some time with it I came up with a system that I believe will work using a very small bearing. This bearing will put pressure against the client which will in turn put pressure against the hobbled bolt. I have attached some pictures for further explanation. Here are the newest pics. I just need to mount the motor, hobbed bolt, gears and put the correct bolts and nuts in. After that I’ll be ready to test, fix any problems and re-configure the design and it will be all done. Almost finished: Check them out. I found some pictures of the finished product that were taken a while ago. 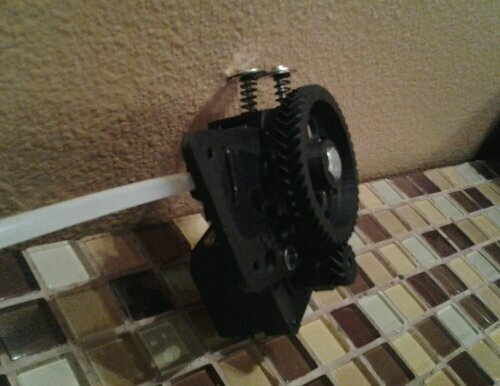 The gears have since been smashed along with my extruder due to a buddy accidentally dropping it and instead of catching it he stepped on it. Well accidents happen and I have a new set of extruder parts hurling through the universe probably at about an average of 20 MPH to my door step thanks to ei8htohms. 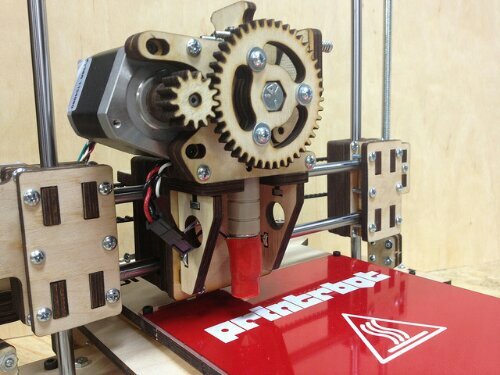 Definitely check out his site he has an interesting Printrbot GO project that is turning out to be a very promising build. I thought I would share the final pictures of the almost finished project. 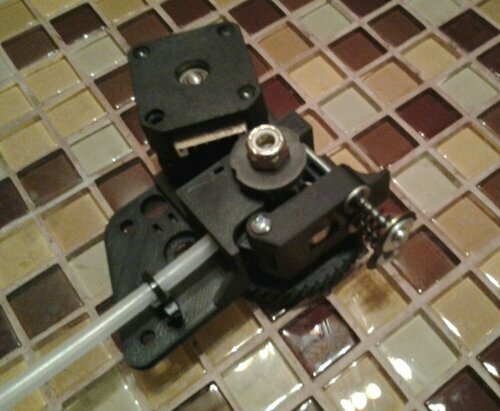 The Wades LC extruder is pretty much finished and only needs a few adjustments. 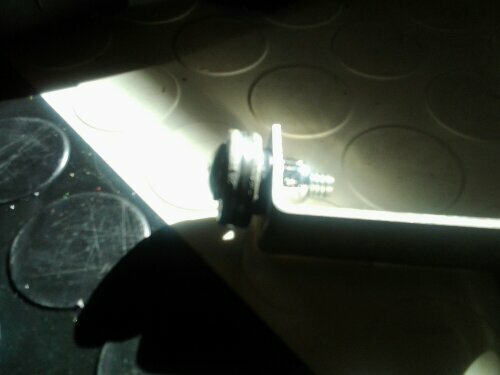 While the printrbot LC extruder needs the nema 17 mounting holes aligned as well as longer bolts for the tension latch. Check them out and let me know what you think. The next step is to finalize the designs and build the new ones out of acrylic or dibond. 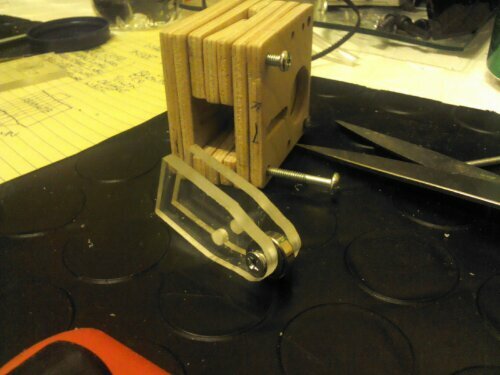 Well I finally got around to starting one of the final versions of the printrbot lc acrylic extruder. I’m not quite done yet. 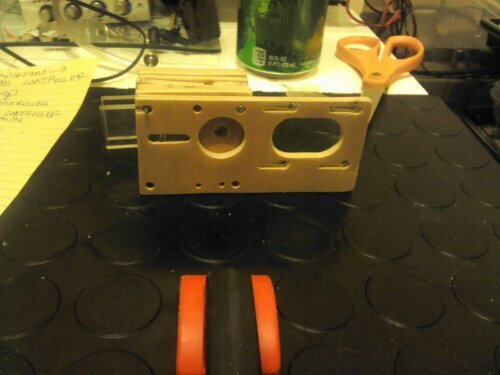 I still have a lot of fitting and sanding to do as this was cut out using a scroll saw and not an actual laser cutter. Its turning out good so far, the color is blue in the picture because I haven’t taken off the protective film yet. I decided to use clear acrylic as I found it to be more fitting than colored acrylic. It will be a little while until I will get to test it out due to my printrbot original is getting an upgrade to the new Printrbot + V2. I will also be posting info on the upgrade for people who are interested in doing it themselves. 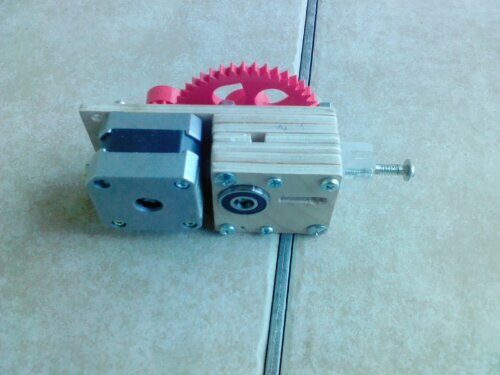 I will eventually test this extruder when I get some gears and the new bot upgraded. 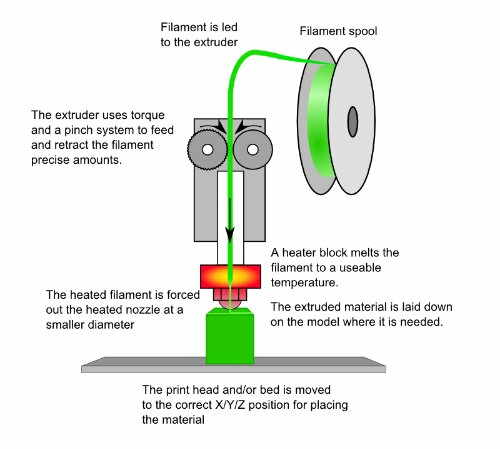 Here are a few pics I found explaining how an extruder works. 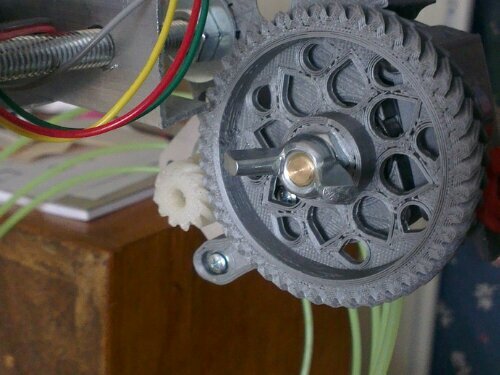 These pictures help to de-mistify the extruder and its functions.